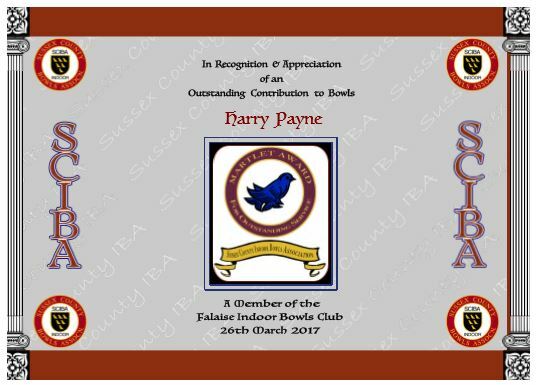 The Sussex County IBA Special Recognition "Martlet Award"
"This prestigious distinction has been introduced to reward those individuals that no indoor bowls club can do without. They are the people who make their club and the sport of bowls special...who put in hours upon hours of their own time to ensure their club runs smoothly and efficiently. Most headlines we read about on bowls tend to centre on the faces and personalities of successful players and their achievements. The Sussex Martlet Award recognizes the individuals behind the scenes who rarely feature "front of house" but whose continuous and selfless services are the life blood of their club. They are also "heroes" in every sense of the word and equal to the highest accolades attained by any club's players on County, National or International stage. 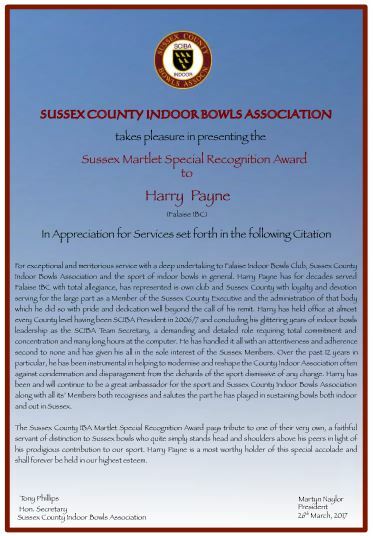 They deserve our deepest gratitude and our ongoing sincere appreciation for all their efforts to sustain bowls in Sussex. 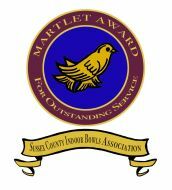 It is hoped the SCIBA Martlet Special Recognition Award will serve to show that a grateful County regards the holder as an exceptional individual who has delivered outstanding service over a sustained period of time to his club, county and the sport of bowls. It is a unique distinction the holder can feel justly proud to have had bestowed upon him and one which we hope he will cherish as a genuine token of Sussex Indoor County's indebtedness, respect and the high esteem in which he is held by both his club and his county. being presented by President Martyn Naylor at the County Finals on Sunday 26th March, 2017. 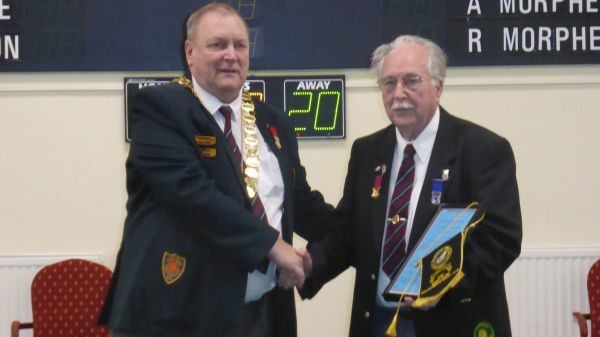 Outstanding Service to his Club, County & the Sport of Indoor Bowls in Sussex. Well done Harry. A justly deserved accolade well earned.